This was how Peter Maurer, the president of the International Committee of the Red Cross, saw the country in August 2014: “Yemen after five months looks like Syria after five years.” As ever, civilians are bearing the brunt of the violence. In fact, Yemen has been in turmoil for far longer, with a split between the north and south areas, and between Shia and Sunni. Internal conflict became even more serious war with the intervention in 2015 of Sunni Saudi-backed coalition forces. 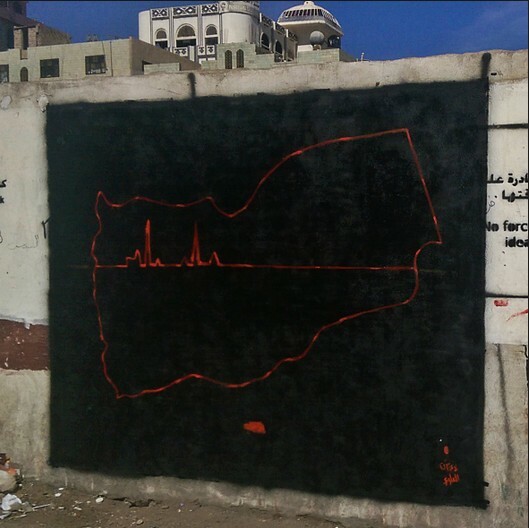 Artists have come to the fore, using a variety of media to contemplate and bring the Yemenis’ situation to the world’s notice. It strikes me that Yemeni art and culture is inherently poetic, how else could they make films such as The Melody of our Alienation? Just as lyrical is The Color of Injustice. 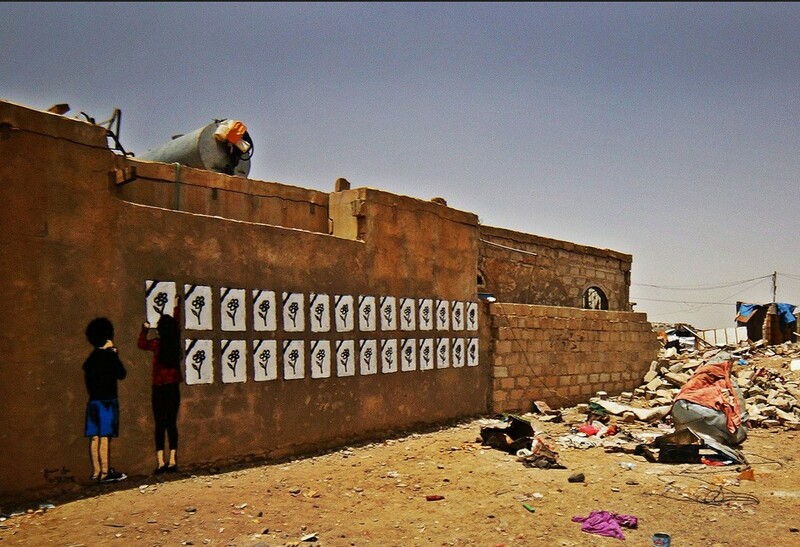 However, here I am concentrating on the activities of Murad Subay, an artist outraged at the ravages wrought in Yemen, who started a series of Campaigns in March, 2012. 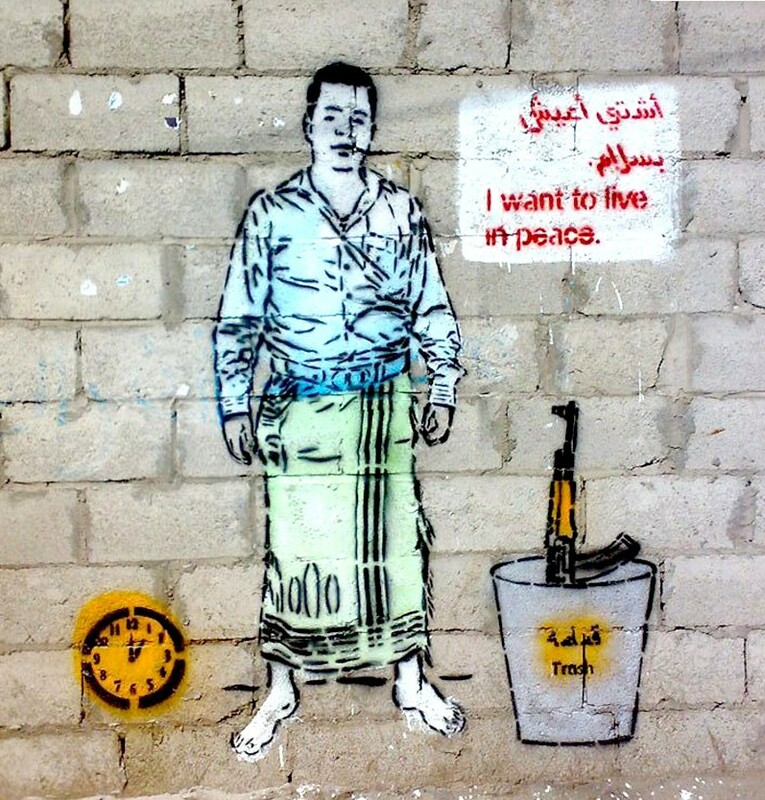 He made street art, and encouraged other artists and the ordinary Yemenis to join in, which they have done with enthusiasm. 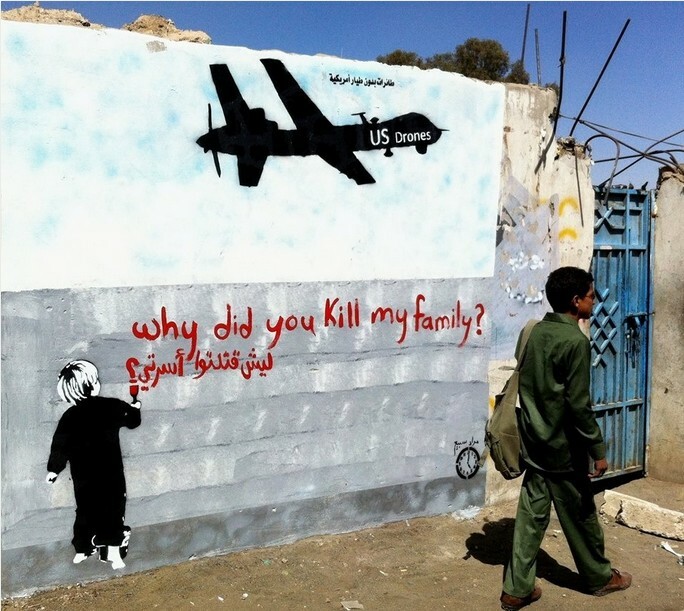 This is despite the obvious dangers of pointing to the corruption, gun violence, enforced disappearances or state kidnappings, the effect of US drones, to mention but a few of the ills that beset the Yemenis. His Campaigns are carefully orchestrated and I have, where possible, obtained images that relate to each of them. Each Campaign or activity within a Campaign produced many images, I have only room for an example from each. His first Campaign was called Color the Walls of your Streets, in March 2015. It started in Sana’a and later was launched in other cities. 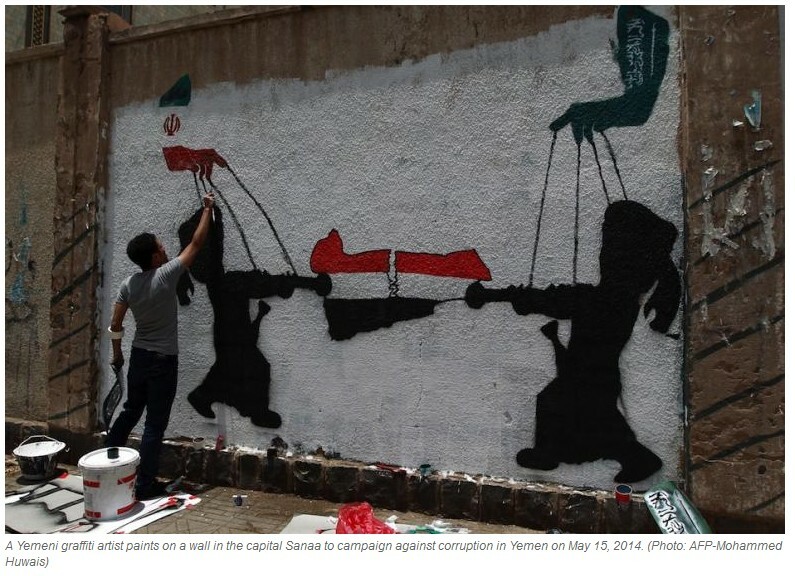 The second Campaign, called The Walls Remember their Faces, in September 2012, referred to the oppression that Yemenis were suffering, particularly the enforced disappearances, or state kidnappings, of numerous individuals. 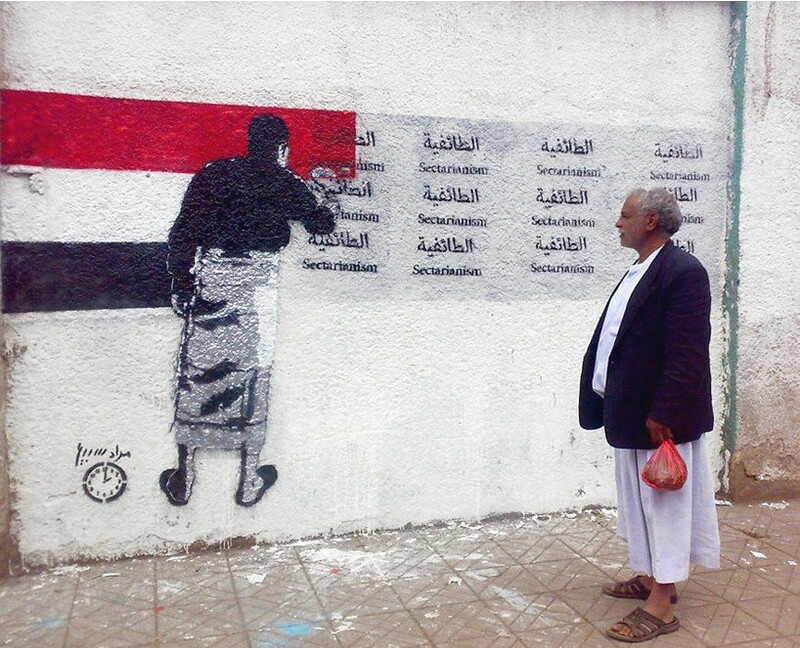 Subay and his friends painted the pictures of 102 forcibly disappeared victims in many areas in the cities Sana’a, Taiz, Alhudayda and Ibb. On July 4, 2013, Subay launched his third and most forceful and ambitious Campaign, 12 Hours. 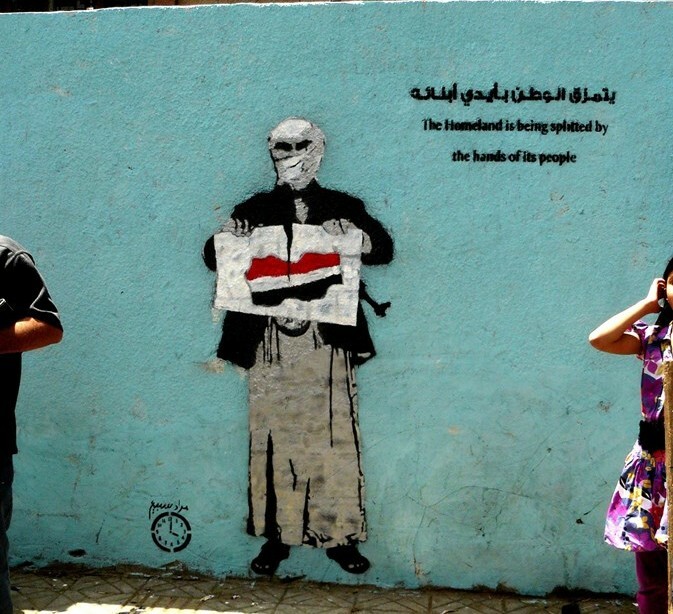 For a whole year, Subay and fellow artists painted murals about a certain subject each month in the streets of Sana’a city. Each subject was a pressing political or social issue affecting Yemeni society. The twelve months equated to twelve hours and a clock face normally appeared on the murals, indicating their place in the sequence. Fellow artists started to join him during the second activity of the campaign which was about sectarianism. In the third ‘hour’ Subay revisited the enforced disappearances or state kidnapping of hundreds of individuals, in Huthi-controlled areas. The fourth hour dealt with the splits within Yemen. North and South Yemen had been warring for some time, but had been united, supposedly, in 1990. Conflicts have repeatedly broken out since. The dreaded US drones, stealthily backing up the regime’s forces, and killing civilians, are the subject of the fifth Hour. 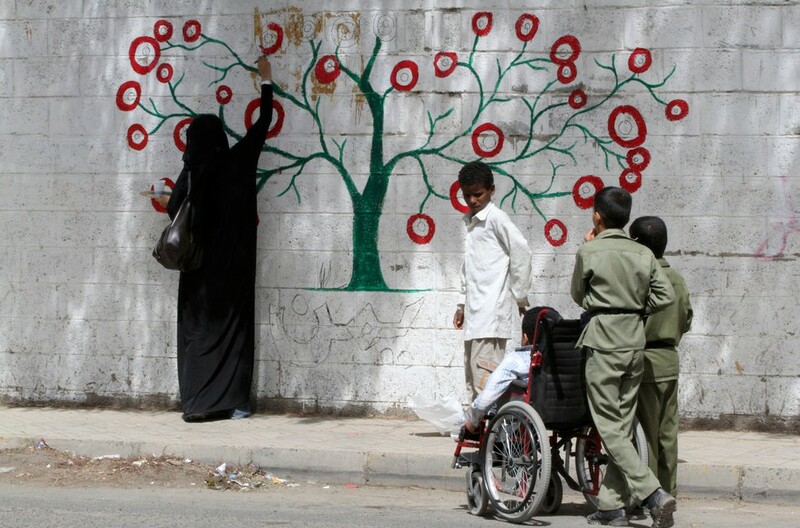 Yemen is one of the driest, poorest and least developed countries in the world. Its conflicts have brought even worse conditions for ordinary Yemenis. 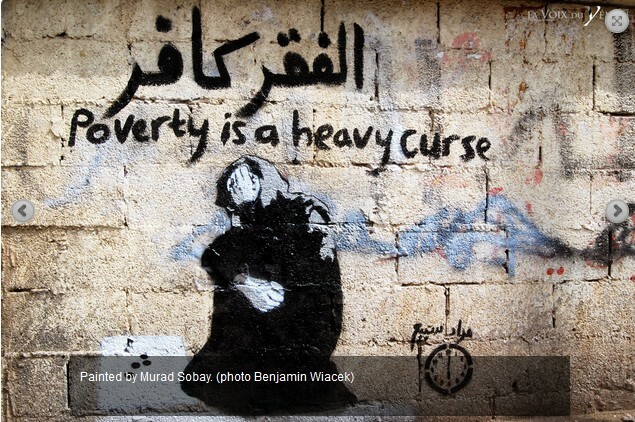 Poverty is Subay’s subject for the sixth Hour. 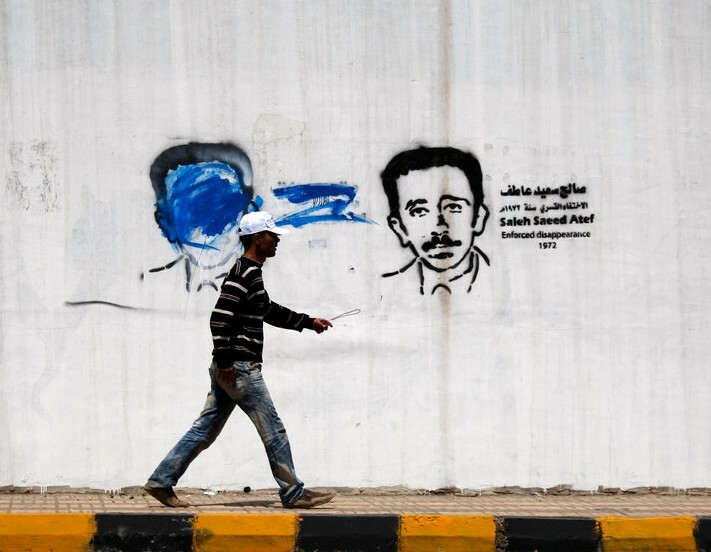 For the seventh Hour, Subay reverted to the key problem for Yemenis—the civil war. Subay sees Yemen’s self-inflicted wounds, and exhorts the country and its people to unite against the real enemies. I could not find an image from the eighth Hour, terrorism. Of course, not everybody liked or approved of Subay’s Camapigns. As might be expected, activists on both, or all, sides have attempted to obliterate the various images that have appeared on the streets. Perhaps that has happened to the terrorist ones. The ninth Hour was devoted to the tragic cases of child recruitment into the fighting factions. The tenth Campaign deals with ‘treason’. 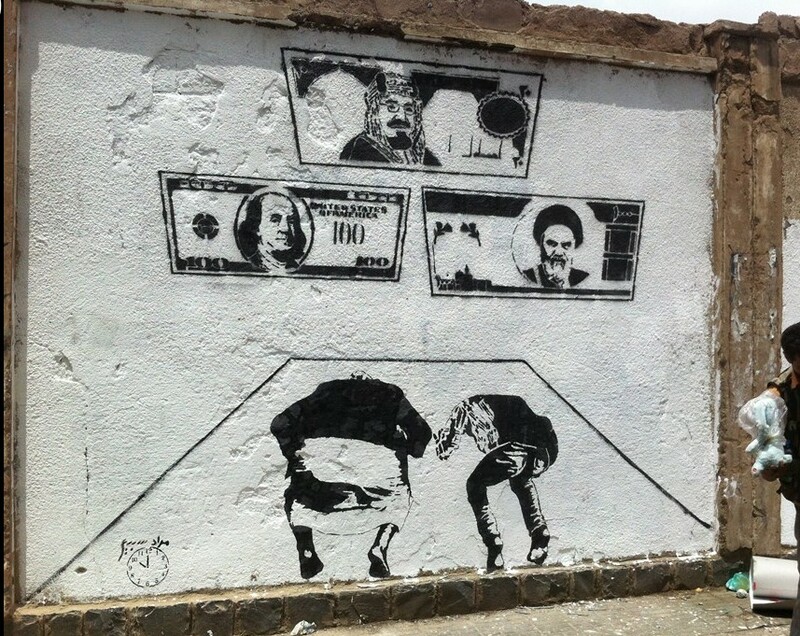 This mural shows Saudi, USA and Iranian currency banknotes being worshipped by treasonable Yemenis who are taking advantage of US drones strikes, Saudi Arabia’s encouragement of tribal insurgents, and Iranian money and weapons going to Shiite Houthi rebels in the north. Saudi Arabia has now, of course, interfered with a vengeance, with full scale bombing. Unsurprisingly, many of the tenth and eleventh hour images were vandalised or covered with white paint. Fortunately some were recorded before this happened. “Corruption is the root cause of Yemen’s stagnant growth, which threatens the country’s future and wastes vital resources, time, and human capabilities on a national level. ” We see corrpt antagonistic parties tearing the Yemeni flag to pieces as they are manipulated by third parties. The final, twelfth Hour, was open to all to add their images. Wonderfully, they declare, “We won’t be silenced”. They resist still. Subay’s fourth Campaign was to consist of sculptures, hence its title Dawn Sculptures. However, power outages and lack of funding forced him to postpone the activity. 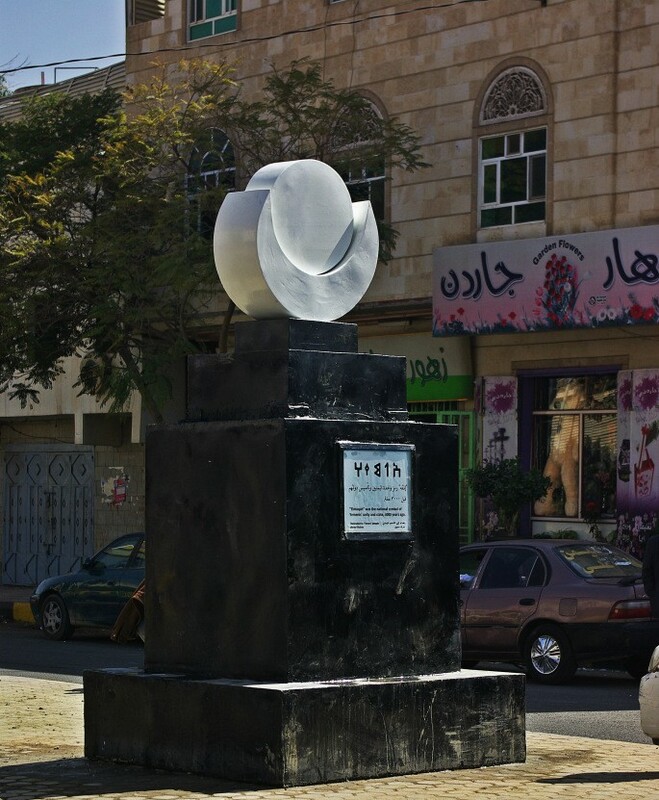 Only one sculpture was made, the Elmuqah, an ancient Yemeni symbol. Its importance for Subay is that it represents the unity of Yemenis and their state 3000 years ago, that he yearns to re-establish. Recent interpretations of the symbol of the god Elmuqah, or Almaqah, are that it depicts bull’s horns cradling a solar disc. The writing on the first line of the tablet is in the ancient Sabatean script. 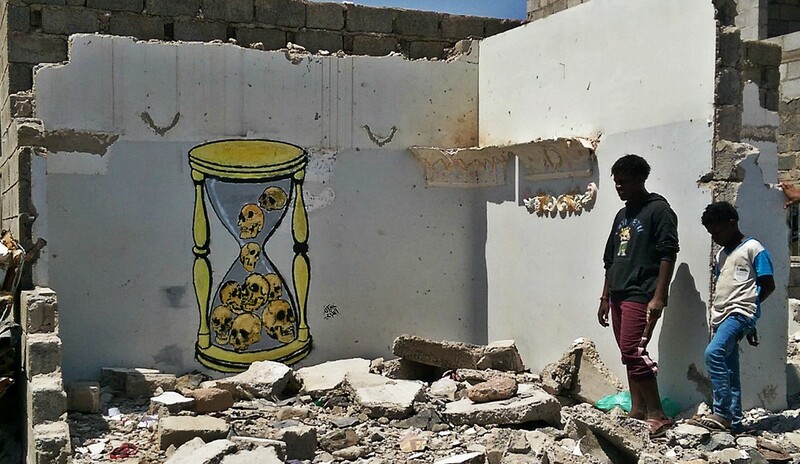 Subay’s fifth Campaign, in 2015, was carried out during the actual war in Yemen, once the Saudis and their allies started bombing and destroying the country physically. Hence the campaign’s title, Ruins, to commemorate the victims of the conflicts and to highlight the catastrophic situation of the country. He often paints in the destroyed areas. 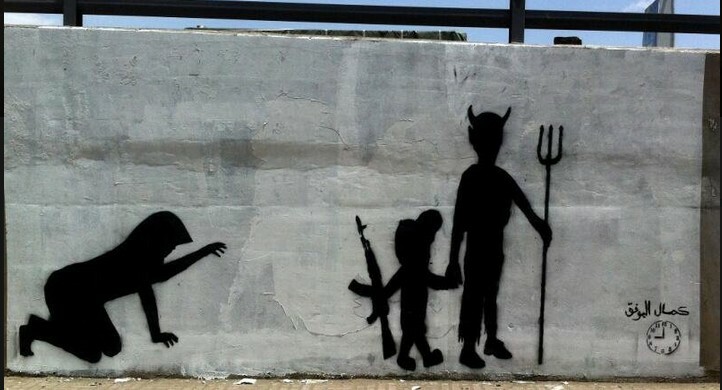 Throughout, other artists have joined in, and this is a particularly striking, bitter and clever image by Thi Yazan Al-Alawai, for the Ruins campaign. 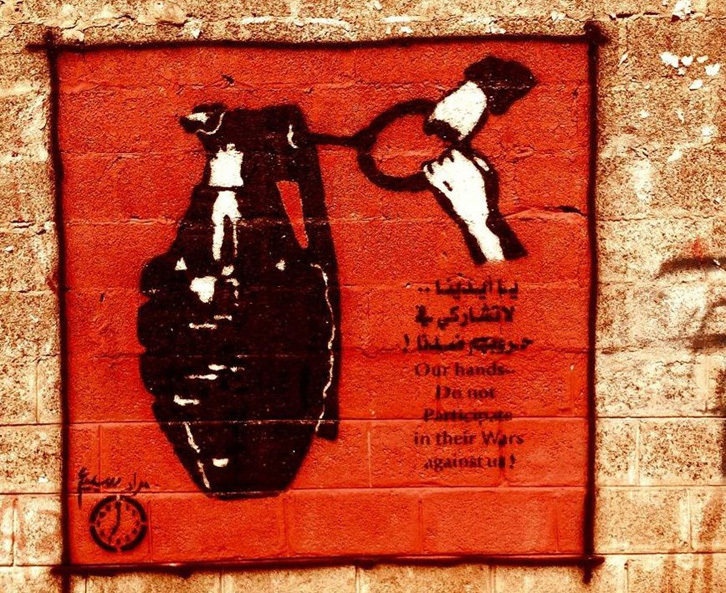 Yemen’s heartbeat is failing. There were many more images produced during the Ruins campaign, not included here. A sort of respite was granted to Subay, when in April 2016 he went to London, to receive the Freedom of Expression Award 2016 from the campaign group Index on Censorship. 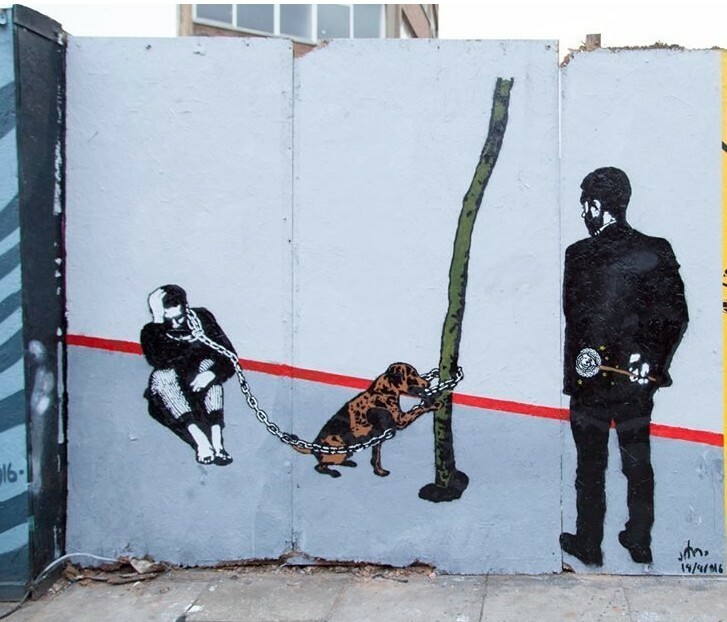 This did not, of course stop him from expressing his passionate concerns about his country on a wall in London, in collaboration with other artists, as part of the Ruins campaign. His acceptance speech is powerful and moving. 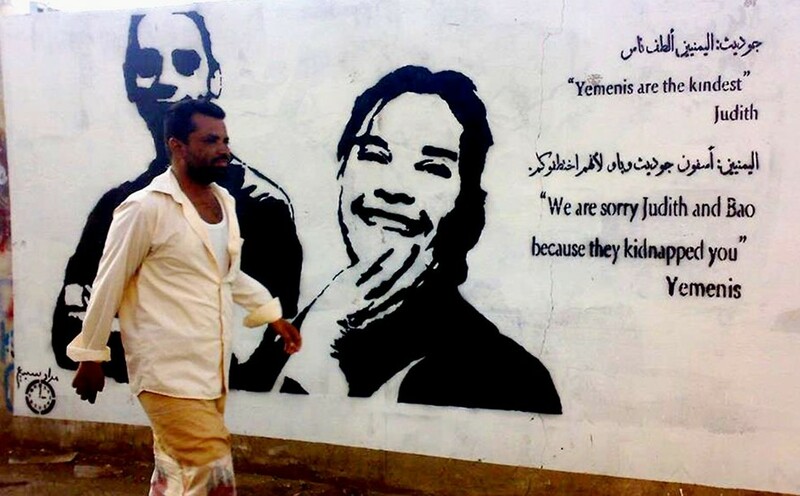 He dedicates his award to the suffering and struggling people of Yemen, and says to “the world’s presidents, kings and leaders who misused their power… you should know that you are leaving behind a dirty legacy…” You can see from the mural that he includes the UN in this, as well he might. There is ‘Compelling evidence’ that UK weapons used on Yemen civilians‘. But the chink of Saudi money is all that the UK government hears. The Yemenis wait in vain for help. Posted in All PostsTagged 12 Hours, color your street's wall, Devra Wiseman, graffiti, murad subay, Ruins campaign, street art, The wall rememeber their faces, yemenBookmark the permalink.